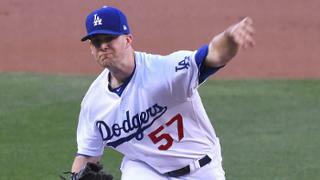 The reigning NL Player of the Week, Alex Wood, put together another outstanding performance on Friday night, pitching 7.1 shutout innings with four strikeouts as the Dodgers beat the Marlins 7-2. Wood benefitted from home runs by Chris Taylor, Brett Eibner, and Cody Bellinger, along with help from the Dodgers infield, who turned four double plays during the game. Alex Wood brought his A-game to the field on Friday night as he shut out the Marlins over 7.1 innings. The Marlins hit mainly ground balls, including three double plays with Wood on the mound. Wood now has a record of 5-0 with an ERA of 1.88 and a streak of 20 1/3 scoreless innings. It seemed like every time that a play happened, Chris Taylor was involved in it. He started off making an error that allowed Giancarlo Stanton to reach first base. Taylor then doubled in the bottom of the first inning and in the top of the second, he used a glove flip to start a double play. In the third, Taylor continued to atone for his error by starting another double play in the top of the inning and hitting an opposite field home run in the bottom of the inning, giving the Dodgers a 2-0 lead. Overall, Taylor went 3-4 with one RBI and assisted in turning four double plays. In the fourth inning, Brett Eibner came to the plate with a man on base and no outs. Justin Nicolino threw him a first-pitch fastball right over the plate, and Eibner crushed it over the wall in left-center field. The home run gave the Dodgers a 5-0 lead. The game really got interesting in the eighth inning, when tensions between the two teams began to surface. With one out in the eighth inning, Ross Stripling entered the game in relief of Wood and induced a double play to end the inning. In the bottom of the frame, Austin Barnes walked with one out before Joc Pederson struck out. Cody Bellinger came to the plate next and with a 1-1 count, he got a fastball high and away from A.J. Ramos. Bellinger drove the ball over the wall in left-center field for a two-run home run, giving the Dodgers a 7-0 lead. The home run seemed to make Ramos angry and that was bad news for the next batter, Brett Eibner. Eibner, who stands a healthy distance away from home plate, was hit in the ribs by the first pitch from Ramos. Eibner thought it was intentional, the fans at Dodger Stadium thought it was intentional, the fans watching on TV thought it was intentional, but there were no warnings issued. In the top of the ninth inning, Ross Stripling threw the first pitch behind Giancarlo Stanton and was immediately ejected. The thought was that Stripling tried to hit Stanton, and after the ejection, the benches emptied. Don Mattingly and Dodgers’ bench coach Bob Geren were screaming at each other, and at some point during the fight, both of them were ejected. Chris Hatcher entered the game and did the right thing in that situation, he struck out Stanton. He then gave up a home run followed by a single, double, and sacrifice fly, cutting the Dodgers lead to 7-2. After that, he finally struck out Derek Dietrich to end the game. Alex Wood got the majority of his outs with ground balls, including three double plays (Ross Stripling induced another in the eighth inning). The ground balls kept the Marlins from threatening Wood and allowed him to erase base runners. The double plays also helped to keep his pitch count down, allowing him to go the deepest into a game that he has gone so far this year. After the game in his interview, Marlins manager Don Mattingly said that he was upset that the Dodgers were swinging 3-0. There is absolutely no problem with swinging 3-0, in fact, most teams do it every time. During Friday night’s game, only one Dodger swung with a 3-0 count. It was Corey Seager, who fouled off a 3-0 pitch in the seventh inning. It seems like Mattingly was just trying to find something to complain about. After the game, no one except for Jerry Hairston Jr., who was covering the post-game show, would admit that the pitches thrown at players were intentional. Dave Roberts said that when Eibner was hit, the ball just got away from A.J. Ramos, and he said the same thing for Ross Stripling. Both pitchers denied throwing at the batters intentionally, and Don Mattingly said that only Stripling threw intentionally. Dan Straily will look to snap a five-game losing streak for the Marlins and the Dodgers will send Julio Urías to the mound in an attempt to extend a three-game winning streak. Urías is coming off his worst start of the year when he allowed six earned runs against the Rockies in Colorado. The game will start at 7:10 pm Pt and be televised on SportsNet LA.